von Don Everett Smith Jr.
Hawthornne residents can boast of the area�s role in the American Revolution remember all who served during wartime, and trace countless families who have lived here for generations. 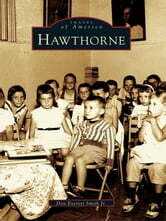 Hawthorne captures the history of this north Jersey borough, home of General Lafayette�s local headquarters, whicH today houses the town offices. It echoes old-timers� memories of days spent hiding and playing in Hawthorne�s high hills and then running down the steep slopes to the Passaic River for a swim. Mehr von Don Everett Smith Jr.